Today is Open House/Orientation for Natalie's new school (1st grade, holla! ), which signals the impending arrival of Fall for me. I decided that today, I'd share the Summer Mantel in my family room, otherwise known as the top of my TV armoire because we don't have a fireplace, despite T's fondness for burning and exploding stuff. It's nothing to write home about, but since it's my blog and we're jumping into school stuff today, I figured I could write to the blog about it. Because the top of the TV armoire is so deep, it can be hard to decorate. I keep a small antique trunk up there because it was a gift from my dad and I just don't have another place to put it. It can be nice to use to layer things. I use old books a lot too. As always, Emma thinks it looks so fabulous she had to sit right in front of me while I shot some pics. But she's my dog, so she has to say it looks fabulous. I didn't spend a single penny on putting this together this year, and I mostly used items I had in my attic bin. 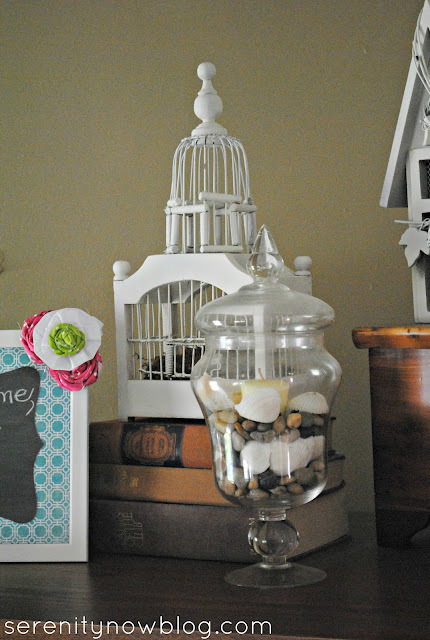 We're starting up a little DIY project and just don't have a lot of extra cash to spend on decorative pieces. I love my white birdcages and birdhouse, and I found some shells and river rocks to toss in an apothecary. And because I am a proud mama, I have to display one of my very favorite pictures I snapped of my girls at the beach last year. I had my friends at Easy Canvas Prints put it on canvas for me, and I get lots of sweet compliments when visitors drop by. So, that's my mantel in a nutshell. Nothing fancy, but I love that I didn't spend any money to put it together. 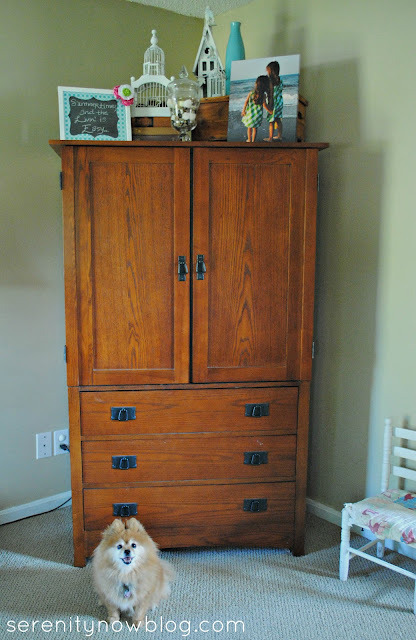 Sadly, I'm ripping it all down this week to do a little Fall/Back to School vignette, but it will be fun! 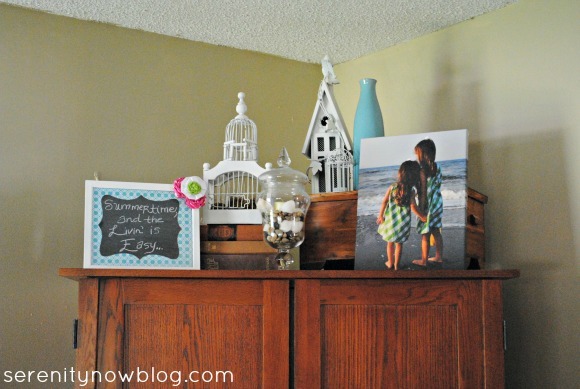 Do you have a mantel? If you liked this post or found it helpful, I hope you'll click your "Pin It" button to add this post to Pinterest, or a +1 for Google Plus! 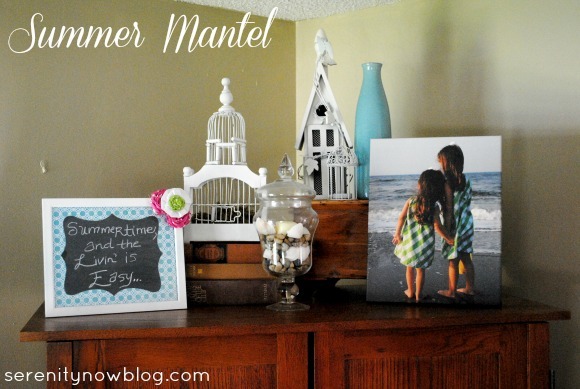 Love your summer "mantel", Amanda. Yes, I have a mantel (and a real wood burning fireplace), which seems kind of odd to me, as we live in Texas. We've been in our house three years, and have yet to start a fire in the fireplace. Hi! This looks great! I love the photo. We do have a mantel that I keep three huge frames with each of our kids leaned on. The photos get switched out occasionally. Also, I will add some things for different holidays or seasons. Overall though, I don't do much, because the bookshelves in our living room get seen more, so I try and dress those up more often. That picture of your girls is SO sweet. I adopted your use of the word "fantel" when I decorated our hutch for Christmas last year--no real fireplace mantel here, either, despite my husband's mutual love of blowing things up and playing with pyrotechnics. I adore the picture of the girls from the beach. What a great shot and the canvas fram makes it look even better. It's kind of sad that it's time to take down the summer mantle, isn't it? This looks great, Amanda! That canvas is precious. What a wonderful photo of the girls. What a pretty display!! I love how everything came together! And that photo of your girls is just precious! 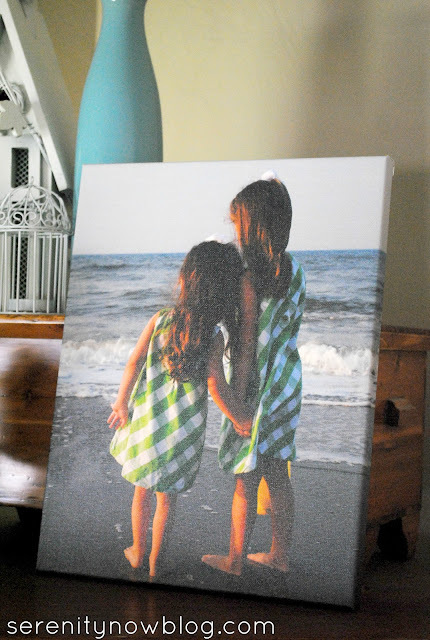 Love it, especially the canvas print of your daughters. A great substitute for a mantel, Amanda!! I love how you made use of this space. And I love that canvas of your girls! i swear everytime we're at the beach, i think we need to start a collection & put them in a jar or vase, like you have. and i never do it. next year for sure. I don't have a mantel either so I'm always trying to "make" a mantel! 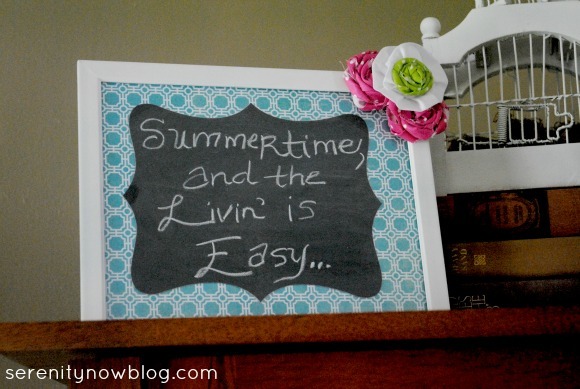 Love your summer mantel! Love that pic of your girls! Too cute!! !